Diets. We’ve all been there. We have the best intentions to “find the diet that really works” and to “follow through this time.” However, as many of us can attest to, the best intentions only last so long until old habits come knocking at the door again. The clean-eating lifestyle has donned several names in the past, but the one constant has been the nutritional value it offers. 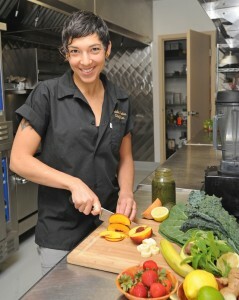 Kimberly Medici, owner of Manzanita (a shared commercial kitchen) and Table Nectar (an organic catering company) in Diamond Springs, is a self-proclaimed champion for this lifestyle after healing her own digestive troubles through experimentation, persistence and commitment to a clean-eating lifestyle. Clean eating calls for an absence (or, at least, a minimal amount) of processed ingredients from your daily meals. To eat cleanly, you want to eat foods as close to their original form as possible. Instead of depriving yourself on a diet, Medici pointed out the joy in focusing on what you can eat with a clean eating lifestyle. “It involves loving yourself enough to limit the amount of processed, toxic chemicals you put into your body,” she said. With the introduction of genetically modified organisms (GMO) in food in the United States, it has become more and more difficult for the average woman to avoid polluting her body. So how do you know when to spend the money on organic, or when it is safe to go conventional? Look toward the “dirty dozen” and the “clean fifteen,” Medici said. The “dirty dozen” are foods that should always be purchased organically, if nothing else. Medici said these foods are the most heavily sprayed, pesticide-ridden foods we consume, partly because they are in such constant high demand. They are: apples, strawberries, celery, cherry tomatoes, kale/collards, cucumbers, grapes, hot peppers, peaches, nectarines, sweet bell peppers, zucchini/squash, potatoes and spinach. On the other end of the spectrum, the “clean fifteen” are foods safe to purchase conventionally (not organic) which includes avocados, sweet corn (corn on the cob), grapefruit, asparagus, cabbage, kiwi, mango, mushrooms, onion, melons, eggplant, pineapple, papayas, sweet peas and sweet potatoes. Another great place to invest your money, Medici said, is organic dairy. “Drinking non-organic milk is consuming by-product from an animal that has eaten GMO, pesticides on the grass and hay, and all of that comes out in the milk,” she said. • Shop around the perimeter of grocery stores. Not only can clean eating help you lose weight, give your skin a glow and keep your skin moist reducing your need for moisturizers, it has been shown to aid in managing and avoiding diseases, saving you the cost of future medical bills. “It can save your life!” Medici said. This merely scratches the surface of the clean eating lifestyle and all that Kimberly Medici offers as a certified raw food nutritional educator. Medici will be teaching a Whole Foods Lifestyle and Cooking Class on Sept. 22 from 12 to 3 p.m., teaching attendees how to make their own salad dressings, healthy green smoothies and offering tips for healthy clean eating in a fast-paced lifestyle. For more information or to sign up for the class, contact her at kim@tablenectar.com or 530-344-7613.